Archive of a bi-weekly newspaper column on vernacular architecture, written for the Lawrence, MA Eagle-Tribune, from 1988-1999. In 1994, the column received a Massachusetts Historic Preservation Award. This column would not exist if Dan Warner, editor of the Eagle-Tribune, hadn't taken a chance on me and my ideas. Features editor Mary Fitzgerald then helped shape the column by giving me 2 rules: Remember that the Sunday paper is entertainment, and use only one word per column which has to be looked up in a dictionary. I am deeply grateful for Mary's superb guidance in suggesting that we add maps, encouraging me to keep rewriting when I floundered, and especially supporting me when I began to write about the whole Valley. In 1999, I stopped writing the column in order to devote more time to my aging parents. In 1699, Hannah Blanchard married Stephen Osgood. Her father gave this land and his father gave the money for their first house. Originally it was only half a house, two rooms up and down, and a staircase. The door with the triangular pediment, and the part of the house to its left in this photo, are that original house. Thirty years later, Hannah and Stephen's second son, Issac, inherited the farm. A captain in the French and Indian War, he wore a wig to remind people of this status. So in 1739, when he enlarged the house, he embellished it with both a triangular and a half-round pediment over the doors, and cornices (hoods) over the large windows. His expansion was really just the usual center chimney house set against the existing structure. The hip roof, not common in that day, was built to accommodate the intersecting roofs. The original house had faced west, sited to the south of the road and highly unusual for those times. One theory is that the house may have been sited this way in order to stand over the well, which is still located under the floor in the dining room. There also appears to have been a door on the north side of the house toward the road. With the 1739 addition, the house faced west and south, with a view across the creek (which circles the knoll and winds over the meadows). But the visitor approaching down Osgood Street from Andover comes awkwardly to the back of the house. Note that the two maple trees in the photograph will leaf out and shield the house from summer sun - shutters were also added in the 1900s. 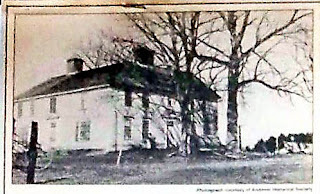 Since this photograph was taken, sometime in the late 1800's the house suffered a serious fire that destroyed the front door with its curved pediment. The scarred beams are still there. Here's an interesting bit of trivia about the house - Jacob Osgood, son of Issac, invited James Otis, Revolutionary orator and lawyer, to convalesce at his home after a head injury. Mr. Otis lived there for two years and taught school. He was killed by lightening on May 23, 1783, while standing in the front door. Each "Sunday Drives" column was limited to 250 words, so when writing them I focused on explaining a few interesting elements from each building, instead of telling its complete history. Georgian architecture refers to buildings built when George I, II, and III were Kings of England. In New England that includes First Period (1620-1715), Colonial (1720 - 1775) , and Federal (1780 -1820). These dates are fluid, as they refer to style and construction (and design is never static), but Georgian refers to buildings influenced by the English Renaissance, coming out of the medieval world. My columns on the witch trials tried to explain how our image of our lives changed in that time. Georgian ends as the Industrial Revolution gives us new tools for construction, and everything else too - our options for shelter, travel and education changed dramatically, as did our architecture. Again, we named that period after an English monarch: Victorian. Click for link building information page.